Thanks to Aldona and Philip Shapiro for sharing this fascinating publication with us. In Phil's words, "Giedrius Kujelis, the Rokiskis Regional Museum's historian, sent to Aldona the attached publication which was issued on the occasion of the day remembering Jewish life and culture. It is particularly gratifying that a considerable amount of text is devoted to the Meller family. The publication is written in Lithuanian with an English translation." Click here to read the entire publication. Keep in mind that it is mostly in Lithuanian with parts of it translated into English. This publication was produced in September 2014 by the Rokiškio Krašto Muziejus / Rokiskis Regional Museum. And we thank them for sharing it with us and with promoting the history of Jewish Rokiskis. 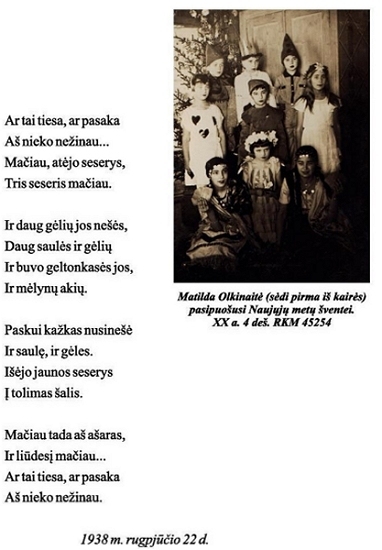 Matildos Olkinaties was a young Jewish poet from Rokiskis. She was killed at a young age in the Holocaust but some of her poetry lives on both as poems and folk songs in modern Lithuania.